This product can be downloaded from the Windows Phone Store. Open two windows to view books side-by-side. Quickly find any passage in a Bible using the book/chapter/verse chooser. Search the Bible by word or phrase. Copy passages to share with others. 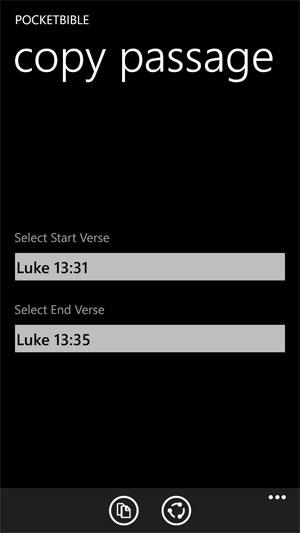 PocketBible is more than just the Bible on your Windows Phone. It is the gateway to a library of Bible reference materials and devotional books. So you can read, grow and share what you learn about God's Word. Everywhere. 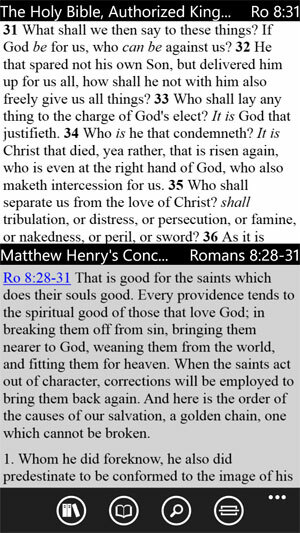 PocketBible is FREE. However, you can enable its Advanced Feature Set for a nominal fee to take advantage of additional features. Install up to 20 books on your device, or unlimited books with the advanced features set. Move easily through Bibles and books by simply scrolling. 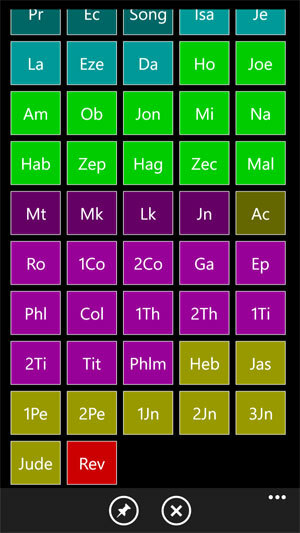 Quickly move around the bible using an intuitive table of contents display. Works with Windows Phone 7.5 and 8 devices.